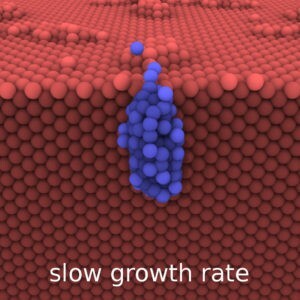 Snapshot of a long timescale simulation of helium bubble growth in tungsten in conditions relevant to operation of fusion reactors. Results demonstrated that the speed at which these bubbles grow significantly affect their morphology. Access to relevant growth rates requires extreme-scale computing. To develop high-performing materials for the extreme conditions found in nuclear fission and fusion devices, scientists need accurate computer simulations that model material evolution on the relevant time and spatial scales. This is especially critical for nuclear applications as the extremely harsh environments lead to strongly out-of-equilibrium behavior, which can only be accurately captured by direct simulations over timescales that are relevant for the applications. While today’s computers have enabled researchers to simulate large systems, researchers need increased computational power to simulate complex materials over extended timescales with more accurate physical descriptions, e.g., accounting for electronic effects. Exascale computing will bring three advanced molecular dynamics codes into a unified tool that simultaneously improves accuracy, length, and time scales, dramatically increasing the range of problems that can be tackled with high fidelity simulations, hence enabling the computational design of nuclear materials with improved performance.